The new AutumnCare Webservice Installer is available now. This handy tool has been designed specifically for AutumnCare’s Enterprise clients. Enterprise clients make use of their internal IT teams to perform system upgrades when new versions of AutumnCare software are released. The new Webservice Installer simplifies these upgrades by automating a majority of the process. Use the Webservice Installer to simplify your organisation’s system upgrades as well as test system installations. System upgrades are performed to install new versions of AutumnCare to the client’s system. For example, AutumnCare 4.7 will be released later this year. The upgrade will need to be installed by our Enterprise clients in order for them to access the new content. Occasionally a maintenance build becomes available between major releases, which clients may also which to install. The Webservice Installer performs stage A automatically. Only stage B, upgrade of database(s), must be performed manually to complete the upgrade. This simplifies the upgrading process enormously, meaning upgrades can be rapidly deployed by clients. Shorter implementation timelines enable clients to get up and running with new features as they become available. Best of all, your staff can start to make use of these features in the delivery of care almost immediately. Prior to installing a new version of AutumnCare, many of our clients opt to install a test system first. This allows staff to familiarise themselves with new features and functionality before using it in their daily workflow whilst providing care to residents. The Webservice Installer will install web services in the same fashion for any client test systems. 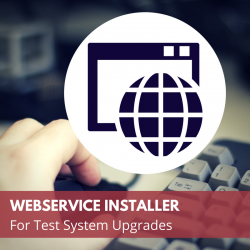 Enterprise clients can utilise the Webservice Installer for faster turnaround times between installing their test system and then their system upgrade. Find out more by contacting AutumnCare’s Support team today. AutumnCare clients can download the Webservice Installer Guide by visiting our Support Site.